When Lindsay says she has a drum shade in her house, I'm sure most of us would picture the regular drum shades, round and generally unexciting. But what she had envisioned and brought to fruition was something a little more literal. 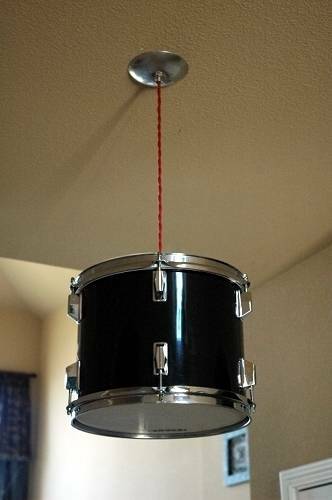 How about a Tom drum hanging from your ceiling? That is all kinds of awesome. My little brother was a drummer in High School, and when he left home and abandoned his drum set, I should have snagged one or two for this project before my mom got rid of it. How perfect would this be in a teenage boy's room? Or rec room? She has it in her hallway! All Lindsay had to do for her light fixture was make a few small additions to the drum itself, and attach it to a pendant light kit. How's that for easy? Check out her whole tutorial at Living With Lindsay.